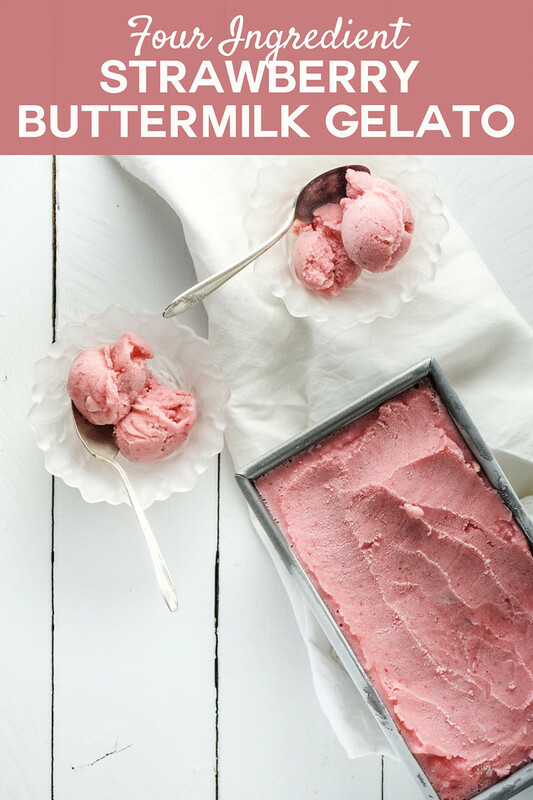 This Easy 4 Ingredient Strawberry Buttermilk Gelato tastes like summer in a bowl. It is bursting with strawberry flavor and the buttermilk gives it the creaminess of ice cream! Earth Fare has had strawberries on sale for a few weeks now and each week I buy more. I’ve used them in fruit salads, smoothies, and even kale salads. I remembered a gelato that I had made years ago – this Strawberry Buttermilk Gelato to be exact. Yes, I originally made this in 2008! I’m happy to say that this easy 4 ingredient gelato has stood the test of time. It’s amazing. I can’t believe it’s been 10 years since I originally made it! 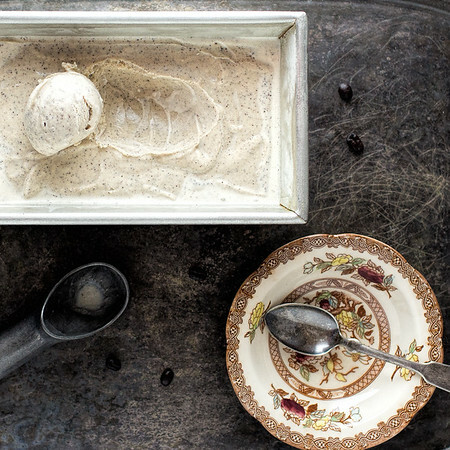 The best part of this gelato (besides eating it) is that it’s a Cooking Light recipe! So, you get all kinds of flavor and creaminess with lower calories!! To make this gelato, you begin by making a simple syrup of equal parts water and sugar. I found this to be plenty sweet and I think next time I will reduce the sugar by 1/4 cup and then maybe even by a 1/2. I’ll update after I try it. After you cool the simple syrup, you place the strawberries, buttermilk and simple syrup into your favorite blender and process until smooth. Pour into your favorite ice cream maker and freeze according to manufacturer’s instructions. You could also modify this Easy Raspberry Sundae dessert and use strawberries instead of raspberries. 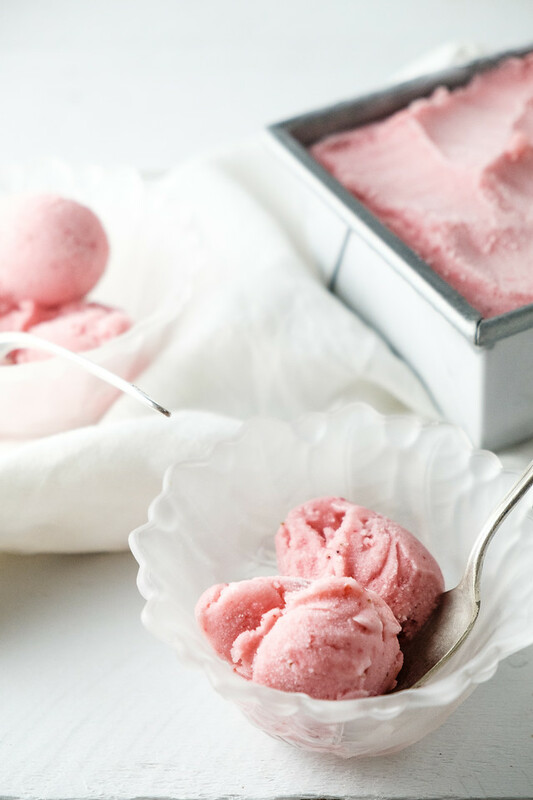 This easy 4 ingredient strawberry gelato will become a family favorite. Combine water and sugar in a saucepan and heat until sugar dissolves. Remove from heat and cool completely. Place strawberries, water mixture and buttermilk into a blender and process until smooth. Pour into an ice cream maker and process according to manufacturer's instructions. That looks amazing! 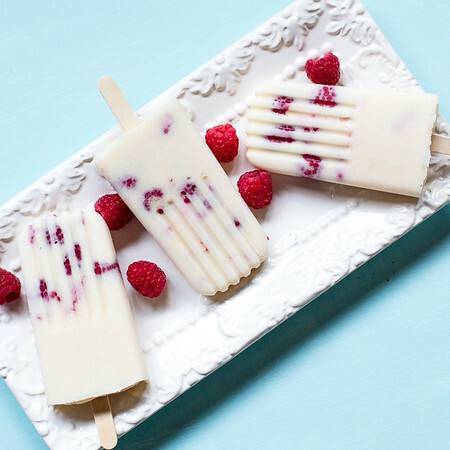 Perfect summer dessert!! This just looks delightful! I will be trying soon! And it’s a Cooking Light Recipe! Fabulous! Looks so refreshing! I love that it’s made with buttermilk. Wow! I wish I could eat dairy products! This looks like an incredible recipe, and I’m going to have share it with my mother so she can make it, haha. Amazing job as always Pam! Yum! I had no idea gelato could be so simple to make! Oh, this gelato looks amazing! I love the use of buttermilk in it to make it sweet and tangy. Yum, I bet the buttermilk give this gelato a great tartness. Exciiiiiiiiiiiiiiiiiiiited to do this! We are going some some crazy heat wave right now, so I will be digging into this for breakfast, lunch and dinner! This looks so pretty and so summery! I love it, can’t wait to try it, we absolutely adore gelato. Alicia – I love my ice cream attachment! Do you like your KitchenAid attachment for ice cream? I’ve thought about getting one. Love the gelato. I haven’t had strawberry ice cream/gelato in ages and I love it! Looks beautiful and I’m jealous of the summer hours! For what its worth, I think this qualifies as a gelato. 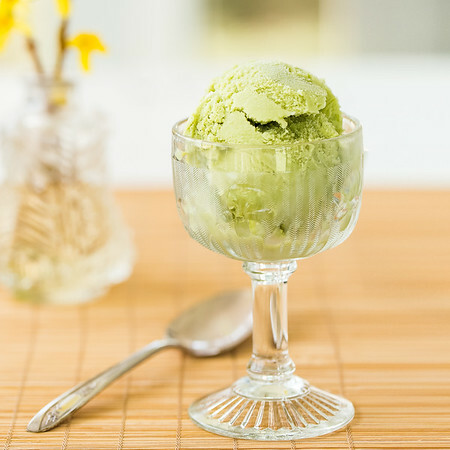 I’m murky on the subject, too, but generally, I find gelatos to be lower in fat than “regular” ice cream, usually forgoing things like eggs and a ton of heavy cream. In the end though, it all tastes delicious, so whatever name it goes by, who cares! That looks good! Great colour. I like the use of buttermilk. Pam, the colour is so vibrant…and “au naturelle”.